Situated in Bandra Kurla Complex, Sofitel Mumbai BKC enjoys easy access to consulates, the Bharat Diamond Bourse, Bandra West, major tourist attractions, entertainment & shopping centres in north & south Mumbai, as well as the Mumbai Aiport. Discover a shining experience in Mumbai's soaring financial district. A city of diamonds and stars Mumbai is famed for its glamour and Bollywood glitz. 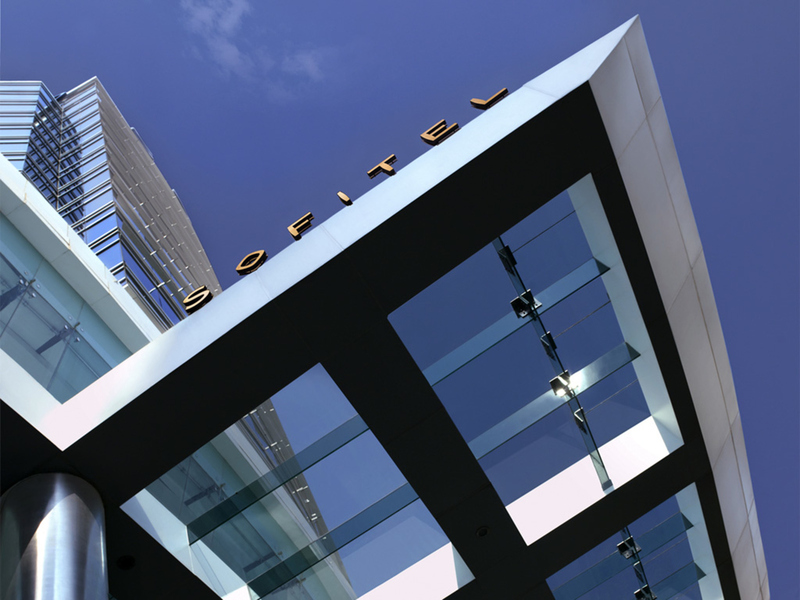 Encounter a glimmering icon of the city's modern renaissance in neo-art nouveau Sofitel design. Strategically located in the geographic centre of Mumbai, Sofitel Mumbai BKC has easy access to Bandra West, major tourist attractions, entertainment & shopping centres in north & south Mumbai through the Sea Link, Eastern & Western Express Highways. Luxurious and contemporary, all rooms feature timber wood floors, innovative design, air conditioning, satellite television and dramatic bathrooms with oversized tubs and separate showers. 40-inch LCD TVs and High Speed Internet connectivity. Interactive boutique dining, with an authentic market feel, reminiscent of an Indo-French blend of tastes and textures, serving buffet and a-la-carte selections. Indulge yourself with a light-bite or beverage to accompany your dip in the L'Oh Pool, perched on the 4th floor of the hotel, providing a birds-eye view of the Bandra Kurla Complex. it has been a pleasant stay except for the arrangement on airport transfers. the billing was not managed well despite giving clear instructions and with hotel acknowledgement. the damage recovery was well done by the chief concierge, Edwin - thank you so much for all that you do. I would also like to praise the housekeeping team for ensuring that room is well cleaned and refreshed everyday. Special thanks to the person who provided a mouse pad after observing that I was using a paper as alternative. I had no idea what I was going to experience coming to Mumbai for my first trip. The Sofitel staff made me feel safe and secure the whole time I was there. Thank you! Could have expected better hospitality & special benefits. The overall stay was quite good. I had informed to the reservations team that I will be celebrating a very special occasion (my wife's birthday) and all your team did was give a cake. Every hotel does this! What is the use of being a member of Accor Plus then? I just expected better hospitality and a few special benefits to make her day a special one. Hope someone looks up on this and can make up for it. A Very fabulous stay with utmost care and luxury available at all times . Sofitel staff remembers all my requirements, preferances of food and beverages and have not given a chance to complain so far. It is tempting to rush back to Sofitel (HOME)and not think of any other Hotel. It was a nice experience overall though the catering services was not up to the mark. Very satisfying stay, we were happy to be offered an upgrade to a club room, the offer was irresistible. The rooms were in good order also the club offered good spread for high tea and the cocktail evening. Our check in and check out was a breeze. There was absolutely no complains to your hospitality and care. The Stay at Sofitel gets better and Better. And with PARAG SHAH in charge at the front office, there is no need for worry, as the reception is better than expected. And the food at the Lounge or Pondicherry is Super delicious and mouth watering There are Food festivals galore and this time it was the BANGLADESH FOOD Festival. And Myrone assisted by Ruhi and others at the front Desk and Hitesh assisted by Arshiya and others make the stay memorable . Merwyn isOmnipresent and the lounge comes to life with his presence. Pondicherry has Amit, Sakina assisted by wonderful people who can handle a crowded Sunday Morning breakfast time with ease and finesse. Sofitel has a 24 hr SPA known as SO SPA and a visit to the SPA is a must if one is tired or just wants to relax or if one has a jet lag. There are many options with 60/90 min Spa Therapies and Therapist CHAN is awesome. The Pool and Gym are well maintained and TUSKERS , Jyran and Artisan must be visited for the variety of Cuisines offered. Chef Nilesh Rawat helped by other chefs serves delicious Breakfast at Pondicherry. Check in and Check Out formalities are completed in no time and with events meetings and the delicious food offered Sofitel for me is the Best Young Luxury Hotel and getting better and better under the visionary GM Biswajit Chakraborty. Cool ...Room given for two sharing should be little bigger. OR you have similar size rooms only? From the the beginning, I was impressed with Sofitel's customer satisfaction. I had made a booking error and the hotel accommodated my mistake promptly and fairly. I was impressed with the front door staff who after only one day, already greeted me with my given name. That's a great memory! Super service from check in to departure. The staff are always on hand to assist. Spacious suites with everything needed for my stay.The buffet lunch has a vast selection, unfortunately could not eat it all. Will be back soon. Apart from the beautiful ambience and amicable hosts, and the services one would expect from a leading 5-star luxury hotel there were few pointers that need attention and improvement 1. Upon arrival, the room was not ready. And while my friend was asked and taken to a lounge, I even after asking and iterating that was from the same company - was denied the service. 2. Issues with the room key cropped up 2-3 times during the single day of my stay, although promptly looked after. 3. Being a king size bed - that was to be shared between two individuals, no one arrived to separate or provide 2 set of toiletries, as promised at the reception. 4. Service was a little slow at the restaurant for the complimentary breakfast as well as there was clutter overlooked on the floor before offering the table to my colleagues and me. (A butter knife and spoon were on the floor below the table, that later we saw as our foot knocked) 5. As we were checking out, after the breakfast, we were in a rush and therefore I could not return it - but my request order of a Maple Syrup Pancakes had pre-poured maple syrup on the pancake, which by the time the server served was soaked making the pancake soggy. Also, expected at least 2 units of the pancake as offered in other restaurants, but received simply one. Everything was great. Since we were celebrating our anniversary, the hotel treated us with a cake and a bottle of wine. Staff wonderful efficient and flexible. Breakfast was heaven. Just one suggestion - the music played in the lobby was a bit loud so it doesn't create a pleasant atmosphere. Right volume of the music creates right ambience. I always choose Sofitel while visiting Mumbai. Good location, amazing interiors and good breakfast.